• Writers write: With the wet and the cool, the garden filled out full and lush. The main weeds this year have been elm and maple tree seedlings and a touch of the dreaded creeping blue bell. I patrol for them every week. 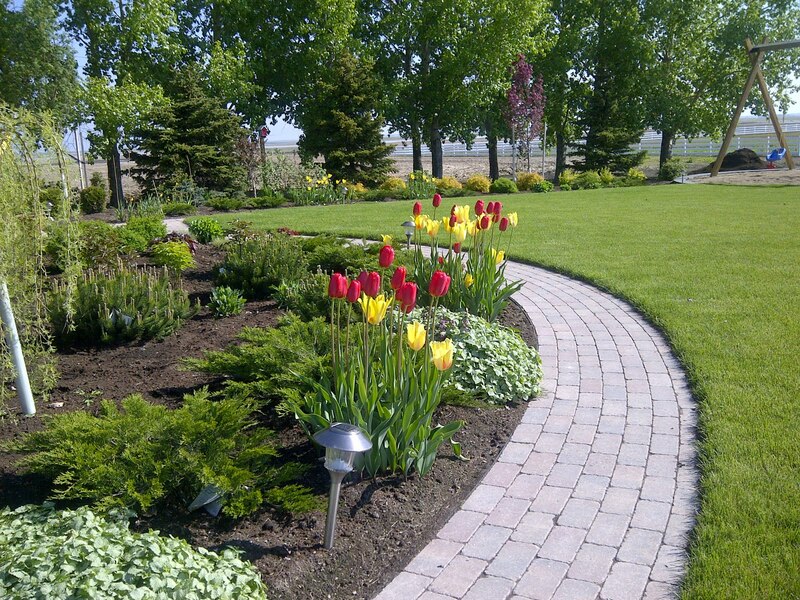 The tulips lasted a full six weeks with their staggered plantings. 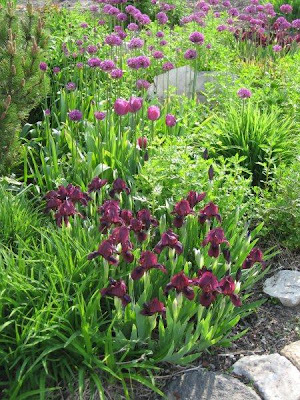 Staggered plantings refers to my planting the bulbs in warm and cool parts of the garden. In the warmer parts, the bulbs showed life in April and in the cooler parts, not until last week. The impatience are actually suffering from the wet and the cool. They need a bit of sun and heat to perk them up. As I garden, I am always reminded of the cycle of life. Four of my friends plus myself have lost our mothers recently. The mothers were in their ninety range and all five of them wanted to go, knowing it was time. It was us, the adult children who wanted them to hang on, to stay for another cup of tea and chat just a while longer. It is always at these times that words fail me. I never know what to write. My fingers click out words such as grieving, condolence and empathy, never able to portray my feelings. It is the passing of a generation and of an era. We are now it. There is no generation above us. The cycle keeps moving, sometimes slowly, sometimes with Godspeed, but always, it keeps moving. Gardening is life. • Theresa over at The Paper Umbrella on 13th had this to say about my tartan tie. “ Perhaps this is a little risqué, but, a simple tartan tie? As a fellow Scot, I think donning the kilt would be a more adequate gesture to do your mother proud. Some men can do this with more style and ease than others. It's a fact. I think you are such a man that could work the pleated garment.” Ed: If I did wear a kilt to these functions, I would have to make a choice in regards to underwear. I would have to decide if I would be dressing as a traditional Scot or as a modern one. I don’t think I could handle the risk or the stress. • Candace Holmstrom who has been a regular reader from day one wrote this: “ It's lovely to get your Garden Report on Sunday afternoons. Whenever I receive it, I am reminded of times past — when Sundays were a time to relax, tend to our gardens, our friends and our family. Stores were closed, there was no place to buy liquor — and we realized the importance of having a day to reflect. Whether a day of reflection is a Sunday, a Saturday - or any other day of ritual — I appreciate the time that you take to put this weekly report together! And...I love the photographs of flowers you often send along. Thanks. Candace.” Rod: Losing our collective day of rest and to be with our family was a direct result of legal action by Super Store in the 1980’s. They sued to sell 24/7. Sales before family. Today, a Sunday family dinner can be difficult to plan with all of the shift work. • Garden Tip: If you find yourself falling behind in mowing the lawn, and it is quite shaggy, best to mow it twice. Set your mower at its highest level, mow and bag the clippings. Then lower the mower to its normal setting and mow a second time. The grass will look much better than if it was only mowed once. • Garden Tip: If you forgot or just did not get around to aerating your lawn this spring, go ahead and do it now. You can aerate any month of the year and it will be beneficial to the grass. • Garden Tip: It is illegal to prune your elm trees at this time of year. The law was passed in order to slow down the spread of Dutch Elm Disease. If you have elm firewood, it is also the law that you get rid of it. Elm wood cannot be stored or transported in or out of the province. • A medical miracle: My dad only had one arm. His left one had been amputated below the elbow in the 1930’s. I never paid much attention to that fact because I had always lived with him having one arm. One day when I was six, one of my best friends informed all of my buddies that his dad only had one arm as well. He then went to on to say that his dad had grown his arm back, thus explaining why he now had a two armed father. I ran home, extremely upset, demanding my father explain why he had not grown his arm back as well. • Reality bites: The problem with school reunions is that no matter how successful you have become, no matter how much money you have earned or awards you have been given, these are the people who will never let you forget that you threw up in Grade Two and that class was dismissed early. • Garden Tips: Sitting on our swing, enjoying the garden, and I look over at my two bergenia plants. One is perfectly healthy and the other is suffering a bit of chlorosis. The leaves are a light green and the veins of the plant are visible as they are dark green. What is the remedy? A teaspoon of iron chelate. Also note that I have spotted chlorosis showing up in some peonies as well, and now you know what to do. • Expectations: When planting peonies the first year, some gardeners are disappointed that they do not get a plant filled with blooms nor does it grow to a good size. Just keep the peonies, or any other plant for that matter, alive and in good health the first year. In the second year, you will be pleased with the growth. I planted several peonies last year in a garden and they remained small and unimpressive all year. This June, they are filled with buds and most are a very nice size. They will continue to fill out each year as their roots develop. • Garden tour: Regular reader Bobby Sue Nichol dropped by for a tour of our garden. She paid the appropriate admission price with six home made lemon tarts. 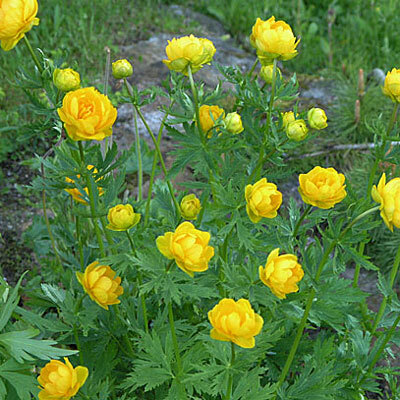 She fell in love with my trollius, which I have written about in previous editions. Bobby Sue also thought that Murphy (our orange, Irish cat) is a handsome bugger indeed. • Never give up: Every year, there are always a certain number of shrubs or roses that have experienced what is commonly referred to as winter kill. Winter kill is when the stems of the plant die back, often to the ground. At the ranch, where I planted many roses last year, most died back all the way. An inexperienced gardener might have dug them out, thinking they were finished. I trimmed off all of the dead stock and fertilized them in early May. I was at the ranch Saturday afternoon and every rose is up, budding out and of a good size. Patience is rewarded in the garden. • New readers: I have received several emails from new readers who asked to be added to the list. Thank and welcome to The Garden Report. I hope you enjoy what you read. • Smart kid: When my nephew Daniel was four years old, he came with Uncle Rod to The Dairy Queen. Blizzards (an ice milk sundae) were new to the market, and Daniel and I were enjoying one. My friend Jimmy Moore, owned the D.Q. on south Albert that we were visiting. Jimmy came over to our table to chat to Daniel and myself. When Daniel found out that Jimmy owned The D.Q., he told Jimmy that his goal in life was to come with his Uncle Rod every day, until we had sampled every flavor listed on the menu. Jimmy looked at me and said “Did you know that you have the smartest nephew in the whole world?” That wonderful four year old turned twenty-nine last week. He’s still pretty smart. • Thanks for reading another edition…Rod McDonald in lush Regina.